As I woke up that Saturday morning, there was nothing that gave me a hint it was going to be one of the most memorable days of my life. Yes, I was starting a new journey but there was nothing to show it was going to be an exceptional one. Today, I can only tell you the exact date I got into the university after a little calculation; I don’t even know the exact date I resumed at the Nigerian Law school. Maybe now you understand why it still amazes me that I remember clearly and still celebrate the date I started secondary school. Since leaving secondary school I have always ‘celebrated’ every November 1st. This is a memoir about my times in FGC Ikirun. I have always wanted to do this but it has taken me time to come to terms to actually doing it. I hope you’d enjoy reading it. Inasmuch as I will try to make it enjoyable to read, my primary aim is to document this period before it blurs off my memory entirely, the faintest pen is better than the sharpest brain. And like I do in real life, I don’t call the school FGC Ikirun, I simply call it Ikirun making many people believe its the place I grew up. True, it was the place I grew up, but it was my school. My parents never lived in Ikirun. 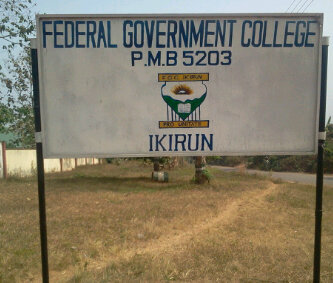 And in this memoir, I will simply refer to the school as Ikirun and not FGC Ikirun. Several times, I have asked myself – where do I start from? As I start this memoir, I start from the very beginning not because I want to do a chronological piece but because the beginning is always a very safe place to begin. My set resumed at the Federal Government College Ikirun on November 1, 1997. If you look closely, you should have questions as to why resumption date was that late. The first term in secondary schools ends in December and normally starts in September. Ikirun was not a normal school. I don’t mean to say it was an abnormal school. 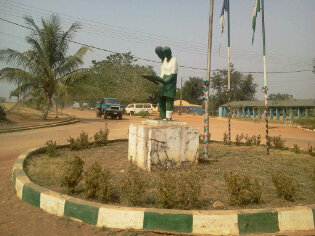 Ikirun was a relatively new school. My set was the 4th set, that meant no one was in SSS 2 when I resumed, the topmost class was SSS 1. I remember starting the journey from No. 4 Alimi Banire street, Alimosho where we lived then. That was the home address on all my files in Ikirun. Knowing I had a long journey to embark on, and more so because my mum and my dad’s official driver that accompanied me would be returning back to Lagos I remember waking up early and putting on my yellow checkered shirt over brown trousers. Across the breast pocket of the shirt and on the waist of the trousers were the letters – O.T. Alade. The same thing had been written on my chapel white shirt and white trousers by my uncle. I also had it engraved on my metal bucket and aluminum plates. That was my second journey to Ikirun, the first had been some weeks earlier in the company of my dad and his driver when I went to see the school, receive my admission letter as well as make payments. But it was my mum’s first time, I guess she wanted to see her son’s new home. Nothing striking actually happened on my first day in school, apart from the fact that I saw Obinna Ezekafor whom I attended primary school with at St. Anthony. Who could have thought that I would bump into a friend from Lagos? I thought I was the only one mad enough to leave Lagos to come school in a bush. He told me his elder sister, Ngozi was also there. I felt relaxed. I also met Mr. Ikotun, my guardian and was introduced to Femi Agbeye, who was to be my school father. One last thing I remember about this day, I got checked into my hostel. My room was a very big one, big enough to accommodate about fifty of us, that’s about twenty five double decker bunk beds and our lockers. The room was for yellow and blue house boys. The room next door was for red and green house boys. The whole block was for the JSS 1 boys. Behind us was the latrine toilet and in front of us was the statue of a boy and girl joined at the arms reading. And he reminded me of how I danced on the metal bunk, displaying no fear or care. The picture of that happy little boy I was lives in my mind. I was a happy and sweet little boy. First to read…. Thanks for the privilege @seunalade. Nice one Seun! Your 1st time experience was similar to mine too. Ikirun was a grooming room that allowed us grow from boys to men. hahahaha, interesting. you and all your funny songs. I can like 10 days later so I don’t have any memories of November 1. but I have one for December 1 which I will share latter. Interesting piece, I will like to read more of this. Niece piece. I hope the memoir won’t end here o. This is just a tip of an iceberg shey? Wowz. Looks like you met your school-fam on the very first day. Took some of us a bit of time. Meanwhile, while you were singing that comical song, I was in the next room re-considering the home-schooling option. Lolz. This is an Awesome piece! I still vividly remember my days in FGC Ikirun also. This place will turn boys to men real quick. I was part of the 4th set also (If I remember clearly), Proud Yellow house room 1 member (my friends then were Agbenga Ajayi, Rotimi Ayorinde, and Femi Ige). I left FGC Ikirun for U.S back in 1999, I will never forget my experience there!